As previously reported, on March 24, President of the Republic of Uzbekistan Shavkat Mirziyoyev arrived in the United Arab Emirates with an official visit on the invitation of the Crown Prince of the Emirate of Abu Dhabi Sheikh Mohammed bin Zayed Al Nahyan. The major events of the official visit took place on March 25. In accordance with the tradition established in this country, the President of Uzbekistan visited the mausoleum and mosque of Sheikh Zayed bin Sultan Al Nahyan in the city of Abu Dhabi. The late Sheikh Zayed bin Sultan Al Nahyan, the first President of the United Arab Emirates, was buried next to this mosque following his passing away in 2004. Today, the mosque and the mausoleum constitute a shrine for the country’s population and a destination for foreign delegations to visit. Sheikh Zayed Grand Mosque is one of the largest in the world. Its construction lasted from 1996 to 2007. As many as 40 thousand people can pray here simultaneously. The President got introduced into the history of the construction of the mosque, the features of its architecture, the conditions created for tourists and pilgrims. Shavkat Mirziyoyev left a note in the Book of Visitors to the mausoleum. The President of Uzbekistan laid a wreath at the Wahat Al Karama war memorial. The memorial, literally meaning “Oasis of Dignity”, was erected in honor of the fallen for the freedom and unity of the United Arab Emirates. It comprises 31 massive tablets each leaning on the other, signifying the unity, solidarity and mutual support that bind together the leadership, the servicemen and the citizens. The Head of the state wrote a memo in the Book of Honorable Visitors of the memorial. The President of the Republic of Uzbekistan Shavkat Mirziyoyev received in Abu Dhabi the Deputy Prime Minister, Minister of the Interior of the United Arab Emirates Sheikh Saif bin Zayed Al Nahyan. At the meeting, issues of practical interaction in the field of public security were discussed. An agreement was reached on the exchange of delegations and experience in this area. 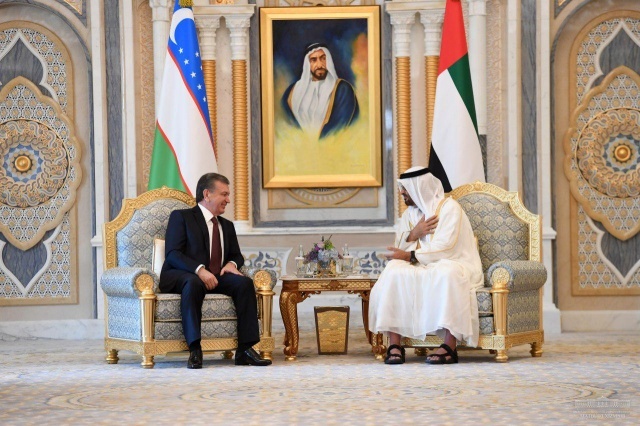 President of the Republic of Uzbekistan Shavkat Mirziyoyev has been met at the Qasr Al Watan Palace in Abu Dhabi with an official welcoming ceremony. Guard of honor lined up to welcome the distinguished guest. 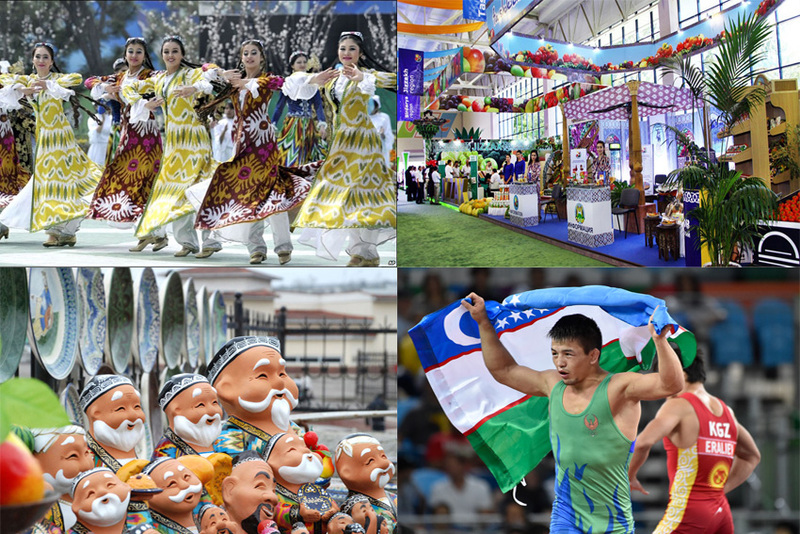 Shavkat Mirziyoyev and Sheikh Mohammed bin Zayed Al Nahyan rose to the podium to pay tribute to the national anthems of the Republic of Uzbekistan and the United Arab Emirates. Negotiations in an extended format with participation of official delegations of the two countries were held. Shavkat Mirziyoyev, expressing gratitude for the warm welcome and hospitality, pointed out the shared religious and ethical values of our two nations, which serves as the basis for development of bilateral cooperation in the spirit of mutual trust and respect. The President of Uzbekistan emphasized that the United Arab Emirates created a miracle in the desert within a historically short period of time – fifty years – to become one of the global centers of economy, innovation, trade, finance and tourism, and noted Uzbekistan’s willingness to bolster cooperation and exchange experience in these areas. Mohammed bin Zayed Al Nahyan gave high acclaim to the reforms underway in Uzbekistan to liberalize the economy, improve the investment climate and strengthen the global standing of the country. The area of the United Arab Emirates is small, but thanks to its authority and capabilities, this country has great potential. The industry, logistics, foreign trade, transport, tourism, civil aviation, innovations and information technologies, banking and finance are developing at an accelerated pace. Today, the Emirates is the main transit country engaged in the re-export of world products to the continent. Convenient geographical location and tax policy are important in attracting foreign direct investment to the country. At the same time, the Emirates have an active foreign investment policy. In 2018, the United Arab Emirates directed investment in the amount of 12 billion dollars to foreign countries. 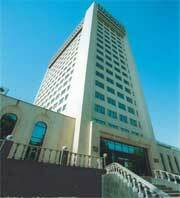 Diplomatic relations between Uzbekistan and the UAE were established on 25 October 1992. For the first time in the history of bilateral relations, Ambassador Extraordinary and Plenipotentiary of the Republic of Uzbekistan to the United Arab Emirates has been appointed recently. 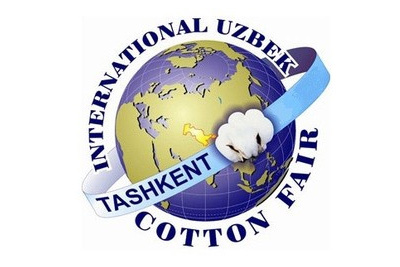 Today, there are 107 enterprises operating in Uzbekistan with participation of investments from the Emirates, 28 firms and companies from the UAE have representative offices in Uzbekistan. They specialize mainly in the production of textiles, building materials, canned fruit, in the printing business, wholesale trade, services. 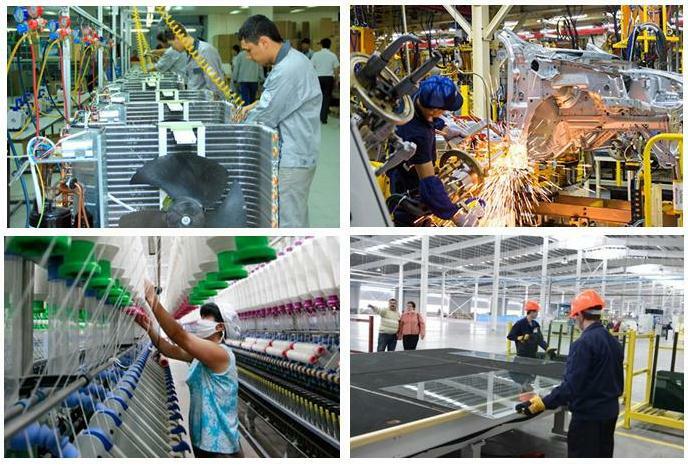 In 2018, the trade turnover between the two countries reached nearly 400 million US dollars. Shavkat Mirziyoyev noted that this figure has increased compared to those of previous years, but is hardly sufficient considering the potential of the parties. In this regard, the negotiations helped discuss issues related to the comprehensive expansion of bilateral cooperation, consolidation of practical cooperation in trade-economic, investment, innovation, banking-financial, cultural-humanitarian and other fields. Confidence was expressed that this visit would serve to raise a mutually beneficial cooperation to a new level. The sides appreciated the outcomes of the third session of Uzbekistan – UAE Intergovernmental Commission on Trade-Economic and Scientific-Technical Cooperation that took place this March 12 in Tashkent. The Intergovernmental Commission was tasked with raising the volume of mutual trade to 1 billion dollars in the coming years, boosting the supply of goods, implementing joint projects for processing raw materials and manufacturing value-added goods. 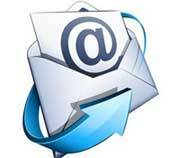 Immense is the potential for cooperation in tourism. The mausoleums of our great ancestors and Uzbekistan’s nature are rather popular among the Emirates’ people. 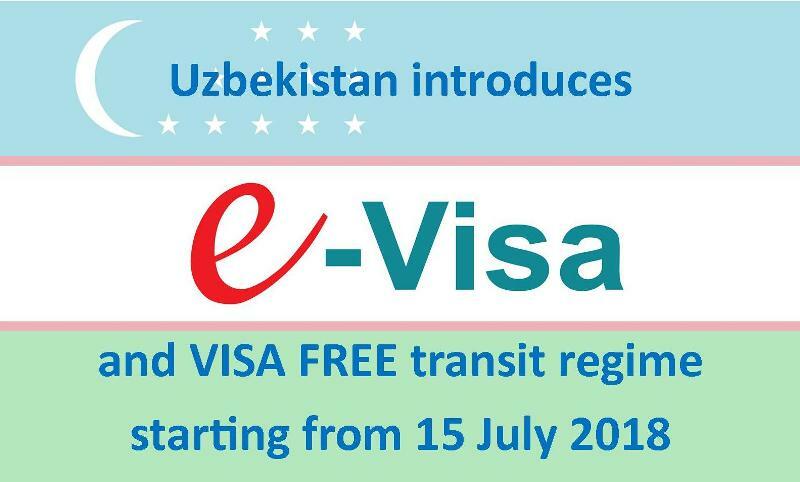 Last year, the number of tourists from the UAE to Uzbekistan grew 1.5 times. 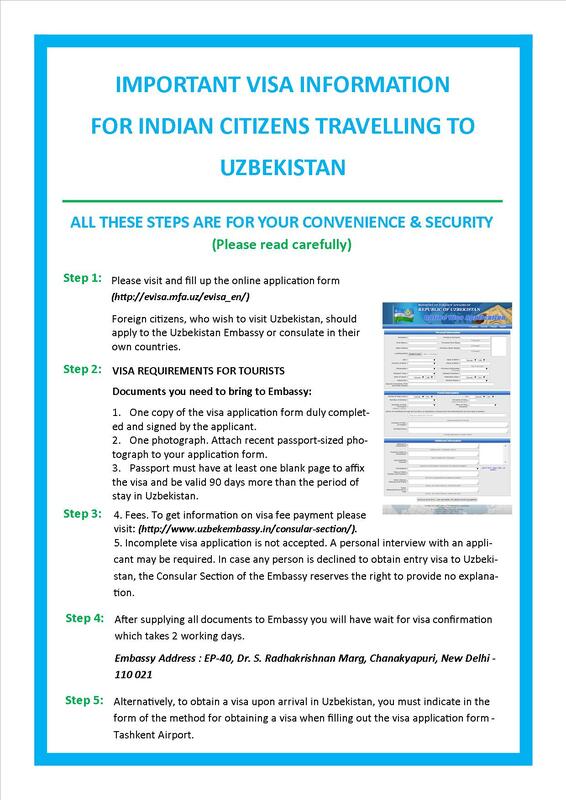 In accordance with a recently signed decree of the President of Uzbekistan, citizens of the United Arab Emirates can enter the country visa-free. It was noted at the negotiations that this would contribute not only to the development of tourism, but also to the further intensification of trade-economic, scientific-technical and cultural cooperation between the two countries. Following the negotiations in an extended format, the sides exchanged the signed bilateral documents. A Joint Statement was adopted between the Republic of Uzbekistan and the United Arab Emirates. The parties exchanged the signed documents on cooperation in the areas of investment, finance, alternative energy, industrial and infrastructural development, agriculture, customs administration, culture and other fields. In general, during the visit, agreements were reached at the amount of more than 10 billion dollars. A meeting between President Shavkat Mirziyoyev and Crown Prince of Abu Dhabi Sheikh Mohammed bin Zayed Al Nahyan took place in a narrow format. The parties exchanged views on issues of politics, security, investment and agreed to expand trade-economic ties, implement joint projects in the fields of energy and infrastructure, strengthen cooperation in science, technology and education. Regional and international issues of mutual interest were also considered at the meeting. The official visit of President Shavkat Mirziyoyev to the United Arab Emirates continues.